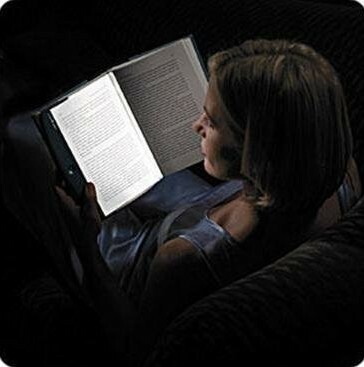 The LED book light is a revolutionary book light that illuminates only the page you are reading, with no stray light escaping to bother anyone else. Just place it on the book and read - the darker your environment the better! The LED book light is designed for hardcover and trade paperback books. 2)Eye-friendly LED illumination. No bulbs to burn out in the middle of a great story. Ever. 3)50 hours of light on four AAA batteries (batteries not included). 4)Distortion-free optical-grade acrylic lens reflects LED edge light onto the page, not into your eyes.